Scale aerobatics is aerobatic operation of a radio controlled scale model of full-sized aerobatic competition plane. We can assume that you are tired of flying in circles, practicing your landings, etc. and looking for a new R/C challenge…and you are in luck! "To date, we have only two entries for the Basic Only Event scheduled for May 5th at the PGRC field in Upper Marlboro, Md. For those of you who have..."
"Greg - for sure I will have to adjust my line in or out. But I still try to keep it in my comfort zone. It may mean coming in a bit or out a bit...."
"One week away. Come one come all to the second annual SC vs sw Smackdown. " "AJ, Congratulations on experiencing the dark side of precision aerobatics! I really enjoy when my fellow IMAC brothers comment on how IMAC could..."
"One thing to add is that judging centering is a whole lot easier if the plane is moving at a constant speed. 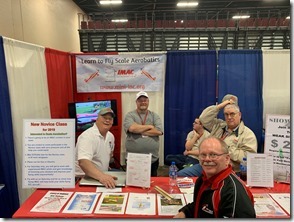 For instance, on a downline, if you..."
" HELLO SOUTH EAST IMAC ENTHUSIASTS Our next contest is two weeks out, HEATH GREEN SKY RANCH Saturday, 04/27/2019 - Sunday, 04/28/2019, plenty of..."
"I am planning to be there to help. Brad"
"I have suggested in the past that IMAC should have some type of presence there. "